Diesel particulate pollution is deadly. It's not the black smoke you can see that is so bad, but the particles so small you can't see that can go deep into our lungs and then pass through cell walls. WALGA advocate to State Government that the impacts on human health of vehicle diesel particulate emissions are fully integrated into transport and urban planning with a view to reducing the harm caused by them. a) seek to ensure that diesel particulate emissions and their cost to human health and the consequent need to reduce them are integrated into all relevant State Government policies as these are updated and reviewed. c) support the integration of the health costs of diesel particulate pollution into benefit - cost ratio analyses used to evaluate transport infrastructure and other significant projects. 1. 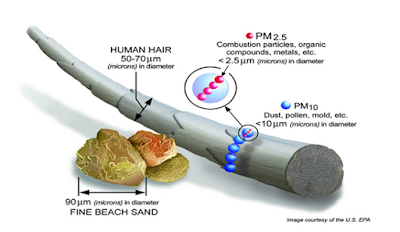 Diesel particulate pollution is a known cause of cancer and heart disease. 2. There is correlation (although not necessarily causation) with a range of other health conditions including Alzheimer's disease, schizophrenia, depression and autism. 3. In 2012 the World Health Organisation listed diesel particulate pollution as a Group One carcinogen. 4. Doctors for the Environment estimate that every dollar spent on reducing particulate pollution can save as much as $30 in health costs to the community.